There’s a new highly Instagrammable food and drink trend that’s brewing up a storm on social media. ‘Moon milk’ is the latest drink to experience a moment with food bloggers, but far from being a novelty sip that just looks good for the ‘gram, wellness buffs are claiming that it has some pretty potent health perks too. SEE ALSO: What is the McDonald's diet- and is it safe? The pastel-hued drink is made by warming milk in a pan and stirring in a variety of spices and a big dollop of sweet honey. It might look like it’s been dreamt up by a bearded hipster in a coffee house in Williamsburg or Melbourne, but apparently it’s been around for thousands of years. The caffeine-free concoction is originally derived from Ayurvedic tradition – an ancient healing system that developed some 5,000 years ago in India. The eastern practice – which counts Gwyneth Paltrow and Jennifer Aniston as celebrity fans – is deeply rooted in the belief that health and wellness depend on a fragile balance between the mind, body and spirit. Those that live the Ayurvedic way of life believe, among other things, that that drinking warm milk before bed can prepare your mind for slumber and help you to nod off faster. So how does moon milk get its colourful hue? Well, that’s all dependent on what herbs and spices you throw into the pan. 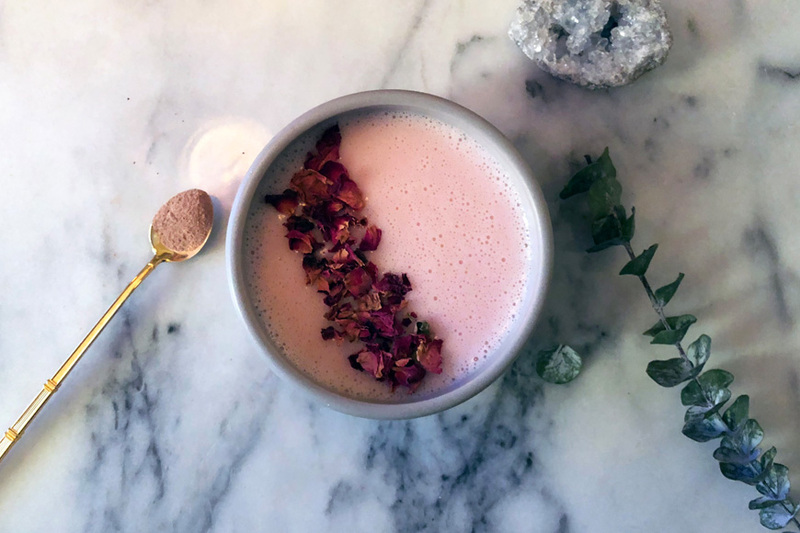 The best thing about moon milk is that you can tailor its healing properties to suit you, and wellness types are creating recipes to help with everything from immunity and stress to anxiety and depression. Adding anti-inflammatory turmeric, for instance, can help with aches and pains while ginseng can lift the spirits and ward off colds and flu. Ashwagandha, meanwhile, is the go-to for easing anxiety (apparently it can suppress stimulatory hormones when you’re strung out and stressed). You might even improve your stamina in the bedroom by stirring in some maca, which is often described as “nature’s viagra”. The arty concoction is fast gaining steam with wellness-savvy millennials who are looking for the next natural cure-all. Pinterest reports that there’s been a 700% increases in searches for the drink since 2017, while Instagrammers have hashtagged #moonmilk over 3,000 times. Although it’s traditionally made with cows milk, there’s no reason why vegans can’t switch things up with their own almond or oat milk take on the trend. Some are even adding edible flowers as a pretty garnish, to amp up the photogenic factor. If you’re not sure where to start, Glow Bar have a recipe for rose moon milk that can help to up your zzz count while giving your skin a nourishing boost. Sure, it might not be as simple as uncorking a bottle of wine, but if you’re looking for a night cap to induce slumber that won’t come at the expense of your head the morning after, we suggest you get on the moon milk bandwagon instead.